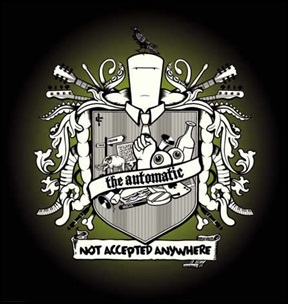 On June 19, 2006, “B-Unique” label released “Not Accepted Anywhere”, the debut Automatic album. It was recorded October 2005 – January 2006, at “Stir Studio” in Cardiff, “Elevator Studio” in Liverpool, “The Chapel” in South Thoresby, “The Peace Rooms” in Hammersmith, and was produced byStephen Harris, Richard Jackson and Ian Broudie.The cover and album booklet artwork were by Richard Stockton. The “BBC” ranked “Not Accepted Anywhere” amongst the top 10 greatest Welsh albums of the 2000s (decade).